Look Feel Be is all about looking good, feeling great and being the difference. 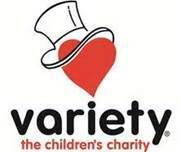 Look Feel Be are hosting an event on Thursday February 28th 2013 to raise money for Variety WA, their favourite charity. The fundraising event will be held at the West Australian Ballet Centre in Maylands and tickets are $75 each. The event is launching the A/W 2013 Collection which embraces women of all sizes and shapes with their clothing ranging from size 10 to 18. The winners of the Look Feel Be competition will also be announced. Details of the competition and this event can be found at www.lookfeelbe.com.au. Included in your ticket price are hors dóevres and sparkling wines! Along with other surprises during the night and a Look Feel Be gift bag! There is certainly alot of entertainment with dancers from Greenroom Entertainment, fashion shows, nibblies, wine and musical entertainment. So head to www.ticketbooth.com.au to purchase tickets and help fundraise for one of the great charitys in Western Australia Variety WA. Why? Charity, Fashion and Fun!